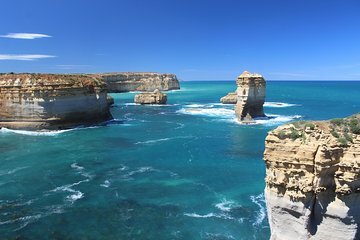 Viaggia in uno dei più grandi percorsi del mondo - la Great Ocean Road - in questo viaggio di una giornata da Melbourne. Viaggiando su un minivan con aria condizionata con autista e con un inizio precoce per battere altri gruppi di tour, questo viaggio ti consente di concentrarti solo sullo scenario. Vedi spiagge, fari e punti panoramici sull'oceano; guardare i delfini, le balene e altri animali selvatici; e visita Torquay, Lorne, i 12 Apostoli, Loch Ard Gorge e altro ancora. Include colazione, pranzo e ritiro e riconsegna dell'hotel. This was a great tour! I am so glad we left early so we could beat the crowds at some of the stops. The place where we ate lunch was fantastic - truly homemade food. My only warning is the road twists and turns a lot. I took motion sickness medicine in the morning and was even feeling it after that. Stewart was an awesome guide! He's knowledgeable and passionate and I would highly recommend this tour! I loved that the tour was a small group and that it started early - we got back to the city in time to have dinner and enjoy our evening which wouldn't have been possible with other tours.